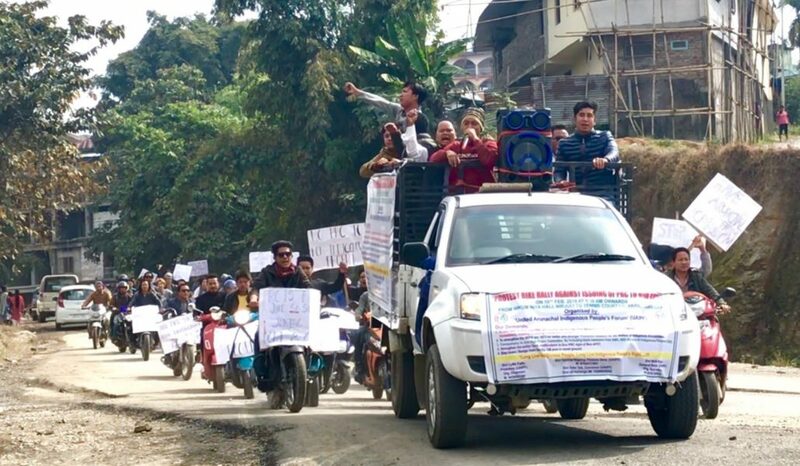 Reiterating its demand for withdrawal of statements given by the chief minister and his deputy to grant permanent resident certificates (PRC) to non-APST communities settled in the Lekang circle of Namsai district, the United Arunachal Indigenous People’s Forum (UAIPF) on Sunday took out a mass protest rally from Nirjuli to the Indira Gandhi Park in Itanagar, the capital city of Arunachal Pradesh. Chief Minister Pema Khandu, while addressing a public meeting at Vijaynagar in Changlang on December 14 last year, had announced that his government was looking into the odds of PRCs to six non-Arunachal Pradesh Scheduled Tribe (APST) communities living in Namsai and Changlang districts and to the Gorkhas living in Vijaynagar. Deputy Chief Minister Chowna Mein had in the same month said in Assam that granting PRCs to the non-APSTs would be a New Year gift for them. Besides demanding Khandu and Mein to recall the promise they made to non-APSTs living in Lekang and other places, the UAIPF also demanded that Mein should resign from his post on moral grounds for the ‘irresponsible announcement’ he has made. Representatives from a number of communities that are not recognized as Scheduled Tribes (STs) in the State have been demanding that they should be provided PRC as they have been living in the State for decades. Amongst those communities are Deoris, Sonowal Kacharis, Morans, Adivasis and Mishings. Most of these communities are recognized as belonging to the ST communities in Assam.